This is both of our third marriage. I've been divorced twice, Emma widowed twice. 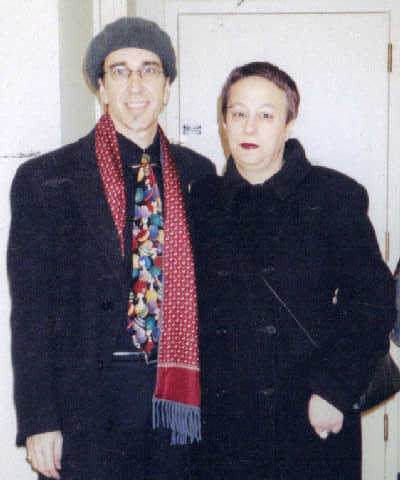 We felt it was fitting to marry on 1 April, 1999. Emma doesn't care much for the "women's music" of the 90s, I attended a couple of Lillith Faires. We both felt that this song represented the passion of our relationship, Meredith Brooks "What would happen?" We even made something of a spectacle of ourselves on the dancefloor at my office Christmas party. I was looking for a companion for the Nouveau party at Chaddsford winery. I found Emma's ad in the personals, I still carry it with me. We went back to my place after the party. I was living in a closet sized apartment in South Philly, and as she entered she looked around and said "Well this won't do, you'll have to move in with me". We've barely been apart since. Describe it however you wish, the design is a shackle, and I don't want to say where we found them. We are bound to each other forever. Emma was born in Philadelphia, the majority of her family lives within a few blocks of where we live now. Her family moved to Jersey when she was a child, but except for a few trips to Jamaica Emma has stayed within a hundred miles of where she was born. She has worked in the restaurant business for over twenty five years, doing everything, waittress, chef, bar tender. Her first husband was by all accounts a saint. He died mysteriously. Her second husband was a nice guy who everyone liked, he committed suicide after losing his job. Emma was unable to have children, she would have been an excellent mother. I have been her first husband to make it ten years. Our ten year anniversary was very important to Emma. One month later her health started to decline. I was born in a small town in Texas. By the time I graduated High School I had attended nine schools in three states. Between High School and meeting Emma I had thirty addresses, not counting military assignments. I have traveled to the forty eight contiguous states, dozens of locations in Mexico, Canada, and the Caribbean, and some interesting military assignments. My first wife gave me three children and a working knowledge of the family court system. My second wife also shares a child with me and when last heard from was teaching music in New Jersey. Emma is the first to last ten years with me. Emma has been a stabilizing force in my life. We have lived at the same address for over seven years. I have never lived in one place for that long in my entire life.